Noella, Clayborn’s Prairie Warbler, is available as a show/performance/breeding prospect to the right home. She is a very special dog who will add a lot to the home she goes to. Her parents are: Phoebe: UKC CH, IntCH Firebirds Smoke’N Fire Brindle CGC, NW2 and Titus: RBIMBS UKC CH Ricmar’s Kristull Tradition. Noella has a beautiful head that is a nice blend of the whippet and borzoi. She has beautiful expression. Her pigment is dark for a dilute color. She has a scissor bite with good occlusion and no missing teeth. She has a good ear set and nice sized ears. Her neck is long, elegant and flows smoothly into her shoulder. She has a good shoulder angle and nice return of upper arm. Her feet are hare and have good knuckling. Her pasterns are strong. Her rear angulation is nice. Her tail set is correct. I think that Noella has a lot of breed type. She has a feminine top and bottom line. She is moderate without too much or too little bone. She is very balanced and square. Her side gait is nice. Noella is almost 21″ at eight months. She is MDR1 clear and CEA carrier. Noella competed in her first UKC conformation shows Nov. 16 & 17. Alyson Brown showed her for me and helped Noella to have a wonderful time in the ring. She had fun and showed like a champ. 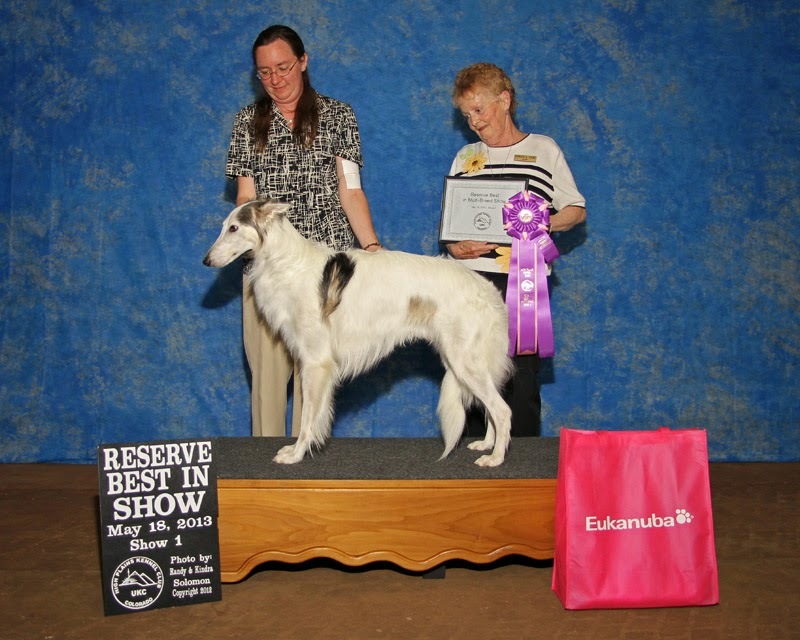 Noella won Best Female in her second show for her first win over competition. She has a very fun personality. From the time she was a tiny puppy her tail has been wagging. She loves people and interacting with them. She can be cuddly, but she really likes to do stuff. She is easy to train and wants to figure out what is wanted.. She is very food motivated and will also work for the lure. She has a toy drive that would be easy to develop too. I have done a bit of agility training with her. In one 10 minute training session, she was doing the dog walk, a-frame and teeter with just a treat at the end. She is very driven on the lure. She has done a few practice runs and has impressed the lure operator. She is very strong on plastic. Noella is very confident and spunky in a comfortable environment. She is full of herself and very bold. Her sire is Titus: RBIMBS UKC CH Ricmar’s Kristull Tradition.